Scene from farmers markets on Molokai. While there is only one farmers market on Molokai, you can still buy fresh produce directly from the farms. 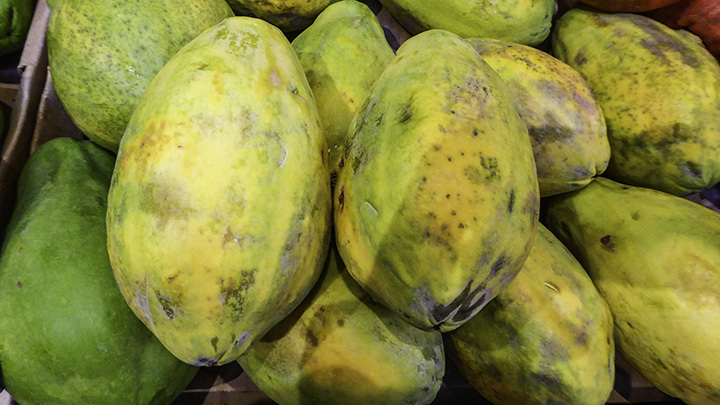 Molokai is one of the state’s largest suppliers of organically grown papayas. You can even sample local aquaculture products directly from Molokai’s fish ponds. 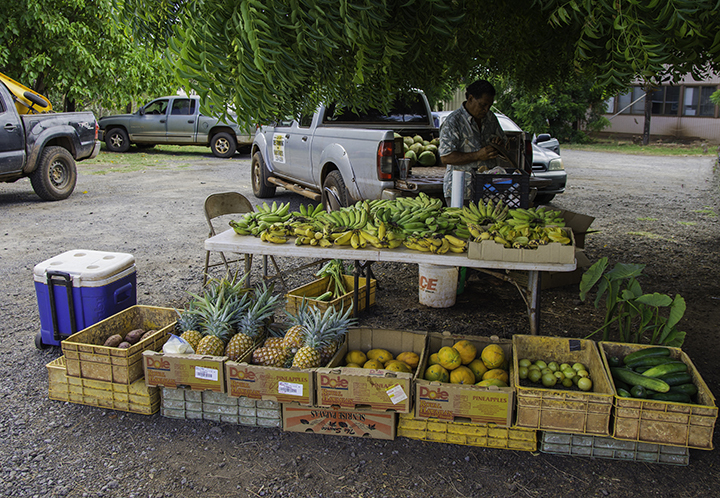 Dive in and experience some of the island’s finest farms and farmers market on Molokai. The Molokai Farmers Market is only farmers market on Molokai. You can find it on Ala Malama Street in Kaunakakai. The market is run by volunteers and is open from 7 am to 1 pm every Saturday morning. Although Molokai’s population is much smaller than other islands, the weekend market is a bustling place. Here, you can pick up a variety of organic fruits, vegetables, seafood and baked goods. After filling their bags with produce, customers can stock up on plants, homemade jewelry, wood carvings and local crafts. The 5-acre farm set in central Molokai has been providing quality macadamia nuts since 1980. Nut-lovers can visit the farm for a chat with owners Tuddie and Kammy Purdy. They’ll tell you the secrets of cracking the extremely hard-to-open macadamia nut. They also offer fresh nut samples, macadamia flower honey and health facts about macadamia nuts. Kumu Farms may be largest supplier of organic papaya to the mainland US. Gathering nearly 20,000 pounds weekly, they ship their organic and non-organic papayas across the country. Visitors to Molokai can stop by the Kumu Farm from 9 am to 4 pm every Tuesday to Friday. Here, you can also sample their papayas, carrots, lettuce, kale, rosemary, thyme and other herbs and vegetables. Keawa Nui Farms raise shrimp, oysters and clams together in over 16 salt water ponds. The farm also raises other aquaculture products like tilapia, Samoan crab and ogo, a popular local seaweed. Stop by to learn more about how aquaculture farming works in Hawaii. Moreover, there’s lots to do here. Attend daily tours of the hatcheries. Experience fishing with nets. Feed the shrimp and fish. Ride horses. And check out their sheep, cows, geese, chickens and pigs.